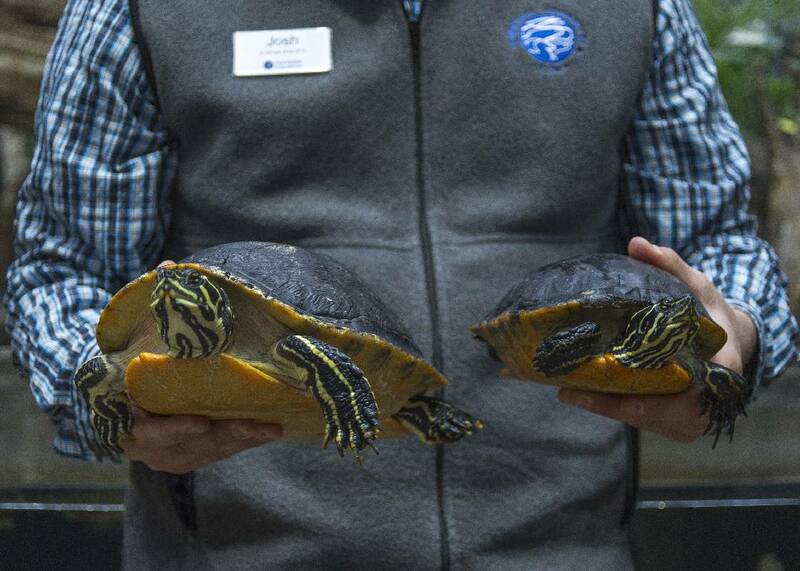 Tennessee Aquarium Conservation Institute biologist Dr. Josh Ennen holds female, left, and male examples of the Florida Red-bellied Cooter. Photo by Casey Phillips /Times Free Press. In addition to size, another example of a sexually dimorphic trait between male and female Florida Red-bellied Cooters is claws. On males, right, the claws tend to be longer, a trait they make use of during courtship behavior by fluttering them in the face of prospective mates. It may sound like a lofty concept, but understanding sexual dimorphism — or the difference in size or appearance between males and females of a particular species — is simple enough in some animals, but for others, more studying needs to be done. From crimson cardinals and azure peafowl to emerald-crowned wood ducks, the bird world is packed with examples of males exhibiting brighter, more vivid coloring than their comparatively drab female counterparts. Among turtles, sexual dimorphism tends to boil down to a difference in size, but the factors that drive female turtles to tower over males, or vice versa, is a largely understudied topic. Recently, however, researchers from the Tennessee Aquarium Conservation Institute and the University of California, Davis, sought to fill this gap in herpetological knowledge, according to a news release. By parsing data from many previously published studies, the group was able to create a meta-analysis that highlights, on a global scale, the natural forces that determine how male and female turtles measure up to each other. "Body size has a lot to do with overall fitness of an organism," Tennessee Aquarium biologist Josh Ennen said in a statement. The institute's geographic information systems analyst, Sarah Sweat, also co-authored the study. "Many people have looked at habitat or reproductive behavior as correlates to tell if males will be larger than females, or vice versa," Ennen said. "But what people had not yet done was combine that data with temperature and other environmental variables to see if there's a more complex story there." After analyzing data on more than 135 species from nine turtle families, the study found links between the direction of sexual size dimorphism and the latitude at which a species is found, the temperature variation and precipitation of its habitat and whether that habitat was primarily aquatic, semi-aquatic or terrestrial. Towards the poles and in regions with widely varying temperatures, females tended to be larger than males. Conversely, towards the equator, males tended to outsize females, especially among terrestrial and semi-aquatic species, while females were larger among predominantly aquatic species. "Our study not only highlights how modern climates may influence sexual size dimorphism in turtles but shows that these patterns are not random among closely related species," said Mickey Agha, a doctoral candidate at UC Davis and the study's lead author. "We found that a portion of the variation in sexual size dimorphism is due to some species' shared evolutionary history." The publication of this study opens the door to follow-up research into how environmental factors drive sexual dimorphism on a finer — continental or regional — scale in turtles. As ectothermic or "cold-blooded" animals, turtles derive their heat from their environment, meaning the study also has potential application for scientists analyzing how environmental changes could impact reptiles, Ennen said. 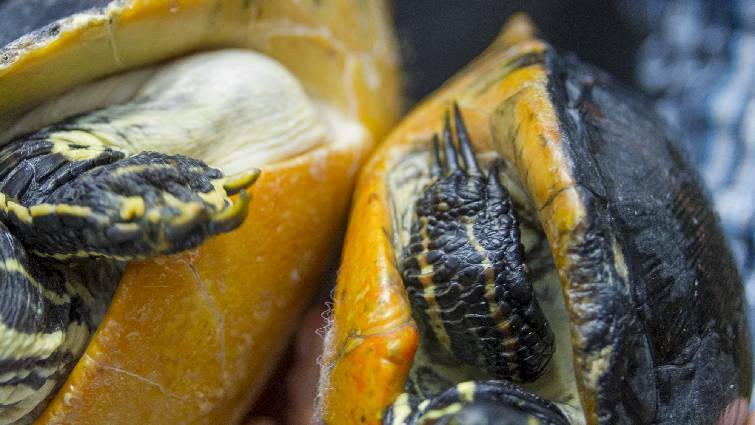 "With turtles, in general, there are a lot of research opportunities," he said. "Climate change is definitely a big deal for reptiles." In some parts of the world, turtles may already be impacted by a warming climate. A study published on Jan. 8 in the journal Current Biology found that recently hatched green sea turtles from the northern stretches of Australia's Great Barrier Reef have been more than 99 percent female due to increased temperatures at their nesting sites. The Tennessee Aquarium exhibits the world's largest collection of freshwater turtles, from pignosed and giant snake-necked turtles to radiated and gopher tortoises. Visitors to the Aquarium can engage in citizen science as they explore by looking for sexually dimorphic traits that distinguish males and females. If they see a box turtle with red eyes, for instance, it's a male. And in the delta country gallery, guests can tell female and male Florida red-bellied cooters apart by the females' stubbier tails and the males' long claws, which they delicately flutter in the face of prospective mates.